Work collaboration software had been around for some time before the Microsoft productivity application, Teams came into the picture. Before using Teams, Chillibreeze used IP Messaging, an instant messaging app, to communicate internally. Apart from Skype for Business, IP was the best mode of communication for the team. It was fast and easy to use. We all loved it! It was convenient. And then Microsoft Teams came along. Chillibreeze migrated to it and it did not take long us to adapt to it. In fact, we now wonder how we functioned without it! The only drawback is that it comes as a package with Office 365, limiting its usage to O365 subscribers. 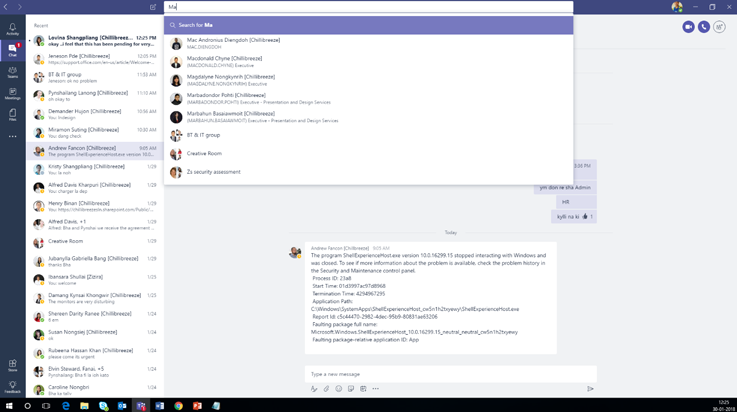 Microsoft Teams is a great collaborative tool. It provides a true chat-based hub for teamwork and collaboration. 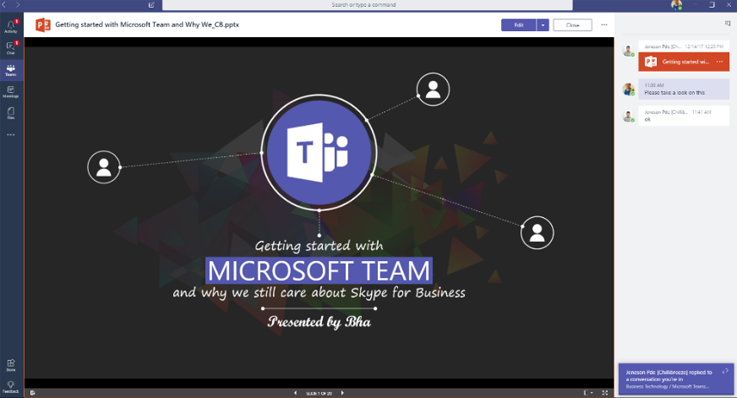 Since we were already using Skype For Business, Microsoft Teams adaption came easy. See what Pynskhem [Creative designer at Chillibreeze] has to say. 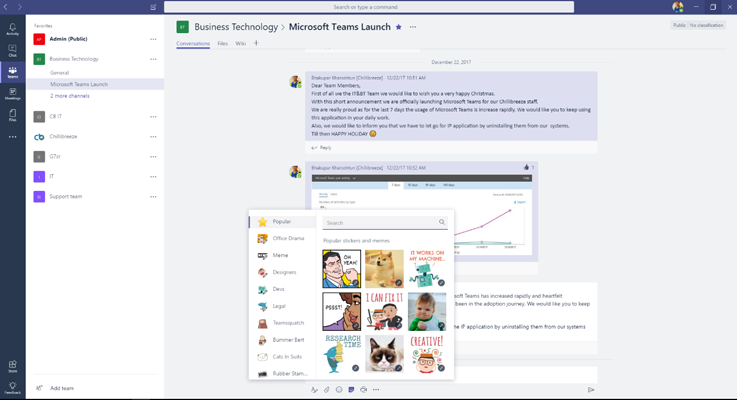 Microsoft Teams helps us to engage more as a team. We can see a lot of interaction, and that is really encouraging and productive. It lets everyone express their feelings and practice their English. We make it a point to not write in Khasi so that non-Khasi staff are included in every conversation. Using Microsoft Teams has really helped us improve our communication skills. Microsoft Teams also saves us time as we can easily reach out to everyone in the team without having to select multiple names like in IP. With the availability of many functions like the wiki, file transferring and saving, it has helped us to standardize our process and way of working. Use the integrated Skype voice and video conference option. MS Teams is integrated with several MS applications such as Word, Excel, PowerPoint, SharePoint, OneNote, Planner, Power BI, Stream and other third-party applications. Whenever we create a team on MS Teams, it automatically becomes an Office 365 group. We can create short cuts to Microsoft documents such as Excel, PowerPoint, Word to provide fast access to frequently used documents. 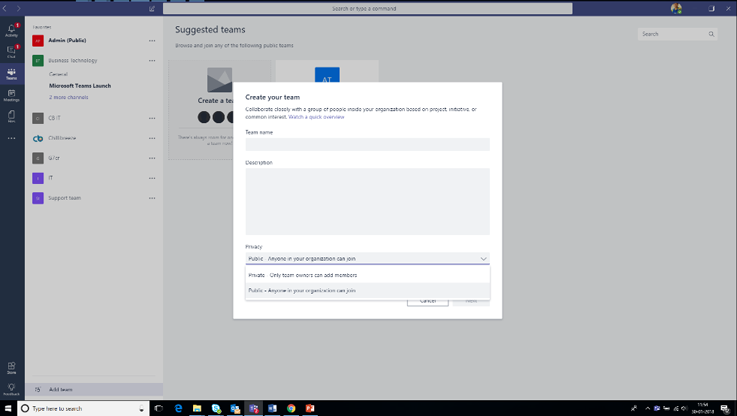 Microsoft Teams can be categorized as Private or Public. Private – only team owners can add members. Public – Anyone in the organization can join. What happens in Teams stays in Teams. What I love about Teams is that I can start a conversation anytime anywhere in Teams and no one is going to miss it. When you close the app and come back the next day, all your communication is intact, and you can always go back and refer to your chats at any time. Let us take a tour of the tool. The activity tab gives you notifications of conversations or activities in Teams that you were a part of or included in. Your notifications cover your recent activity, private chats, teams, meetings, files, and apps. This feature helps you start a conversation with colleagues. You can search for your colleagues on the search panel to engage in conversation with them. If three or more people are involved with the subject, you can add them to the conversation. You can also name the group according to the topic. You can create your own team based on departments or projects. E.g., Sales, Public Relations, Event Planning, etc. Within a team, you can create multiple channels to organize your work by topic or project. E.g., Annual Sales Meeting, Quarterly Business Review for Sales Team, Press Releases, News and Updates, Fact Checking for Public Relations and Marketing, Logistics and Scheduling, Venue, Budget for Event Planning. Team members can jump into the conversation at any time. Threaded chat makes it easy to scan the stream and keep track of the conversations relevant to you. You can embed images, files, gifs, stickers, emojis, and even third-party connectors or bots for a truly integrated experience. Your Teams files, notes, and frequently accessed tools can appear as Tabs. You can even pin your favorite Office 365 and third-party apps for easy access. We can schedule meetings through Teams. Meetings are synchronized with Exchange online. 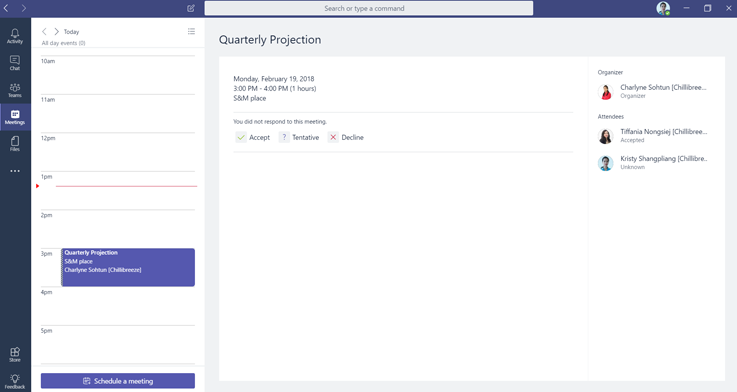 When we schedule a meeting via Outlook or AWL, we will also be able to view the meeting schedule on Teams. Under files, you will be able to view all recent documents accessed, shared in Teams or any other files accessed from cloud storage such OneDrive and SharePoint. 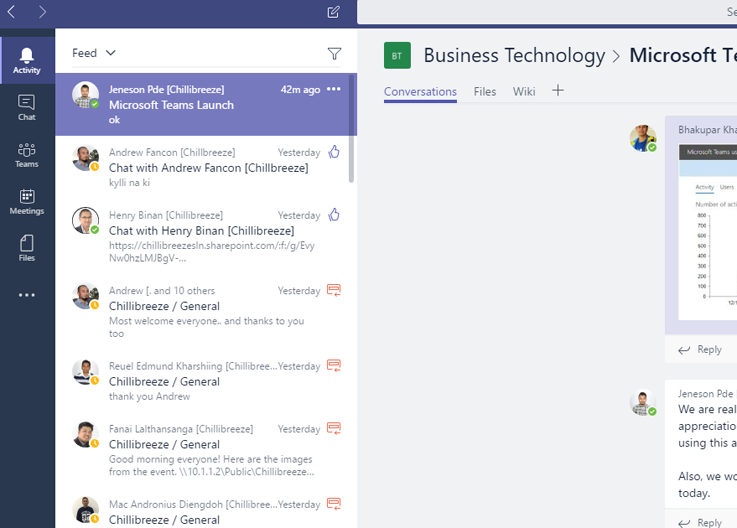 Apps in Microsoft Teams can be integrated mostly in the form of a Bots, Tabs, and Connectors. 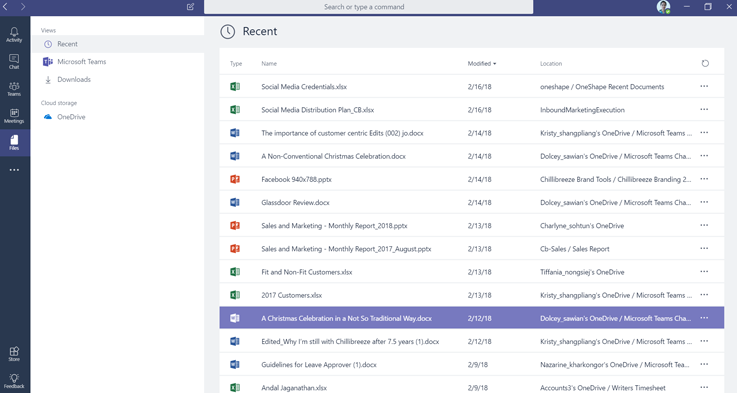 Microsoft Teams is used extensively across the company to communicate with team members and across departments with increased flexibility. With Microsoft Teams it is much easier to refer to old communication. It saves users time by making it easy to reach out to everyone through Teams without having to select multiple names and adding them to a new conversation every time. 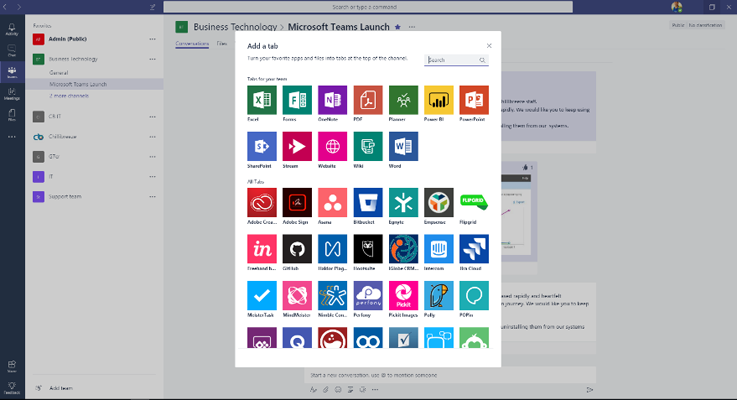 Microsoft Teams’ fantastic features can really help us work closely with our customers. We can create a team and give access to our customers and vice versa. Teams has increased engagement and improved productivity by moving us from silos to collaborative teams with members who are always in sync with the rest of the team.